The sprints were dominated last season by Austin Kratz, the Dock Mennonite phenom, who flew into the PA record books. Now at Arizona State, the 2018 indoor state champ at 60 meters, will look to tear up the collegiate scene. Back in PA, the race is on for the top spot in PA in the short sprint. All 8 finalists from last year's state meet in the 60 meters were seniors, meaning we'll get a whole new crop of medalists this season. With no clear favorite right now, the state will be looking for some breakthroughs to push the sub-7 barrier. There were a number of boys who made it as far as the semifinals at states last year in the 60. Chambersburg's Tyeshawn Worrell went 7.05 at states last year and narrowly missed a spot in the finals. That time is tied with Springside Chestnut Hill's Robert Gentile for the top returning time in the state. Both boys should be factors this season. Central Dauphin East's Shawn Brown went 7.06, also just missing the state final. Outdoors, Brown went 10.72 to win a Mid-Penn title and then placed fourth in a competitive AAA 100 meter state final. Look for a strong winter out of Brown. The same goes for Cohen Russell (above) of State College Area. Russell went 7.06 to win at Kevin Dare early last winter, but missed out on the semis at states. But into the spring, he turned on the jets, running 10.70 in the 100m state final in AAA to take second. Now he's ready for more this indoor season. 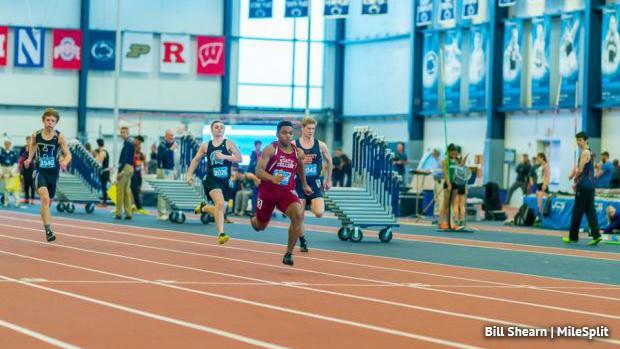 Among the other returning semifinalists from the 60m last year are Coatesville's Eric Kirk, Neshaminy's Savion Hebron, Penn Charter's Edward Saydee, and Lower Merion's Devon Tate. Hebron earned a state medal in the AAA 100m last spring after capturing the District 1 title in the event. Other quick boys back are Greater Latrobe's Joseph Piper, Bishop McDevitt's Tyler Byrd, and Gettysburg's Ammon Robinson. This crop of returners is filled with potential. It was a potential that shined through during the outdoor season. This winter, we'll see which sprinters are ready to make the leap to state and possibly national glory.